I'll bet you were hoping this post would be my reveal! Believe me, I wish it was, but I have more building to share. Since I posted the Trim, shelves, and rods, I have been back to some big building. 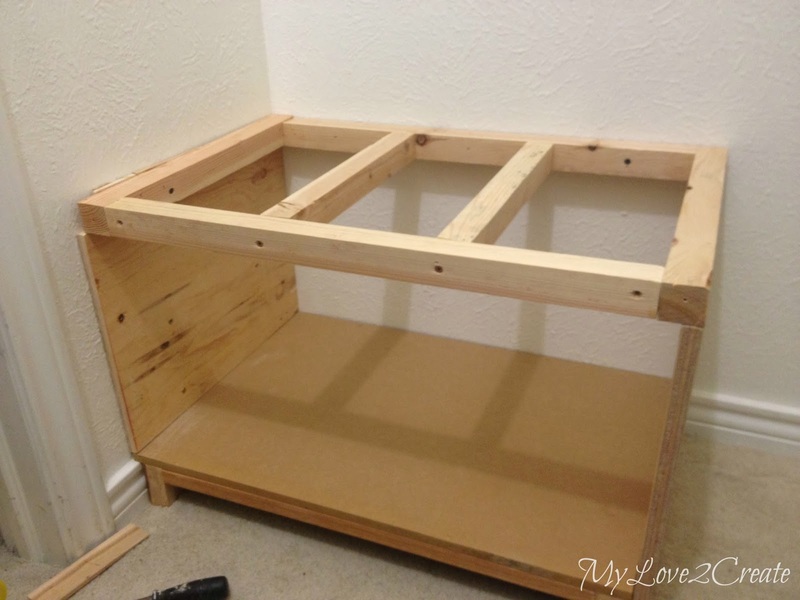 If you remember in my Master closet makeover plans, I had a shoe shelf and a bench with some shelves above. 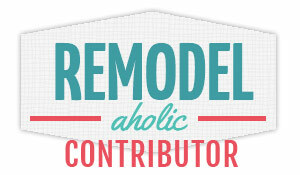 This post is all about how I built them! Let's start with the shoe shelf. In my plans I had it on the other side of the tower and I decided to flip them around. You can see it looks like a tight fit to get my clothes, but it really isn't. Trust me, I have tested it and it totally works. 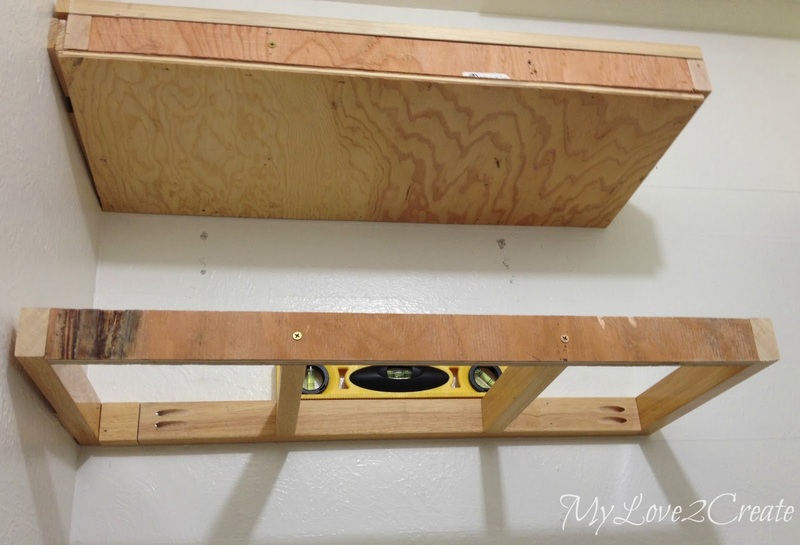 In the above picture you see I have built the shoe shelf and installed it, the two boards you see to the side are the trim, I will not be covering that in this post. 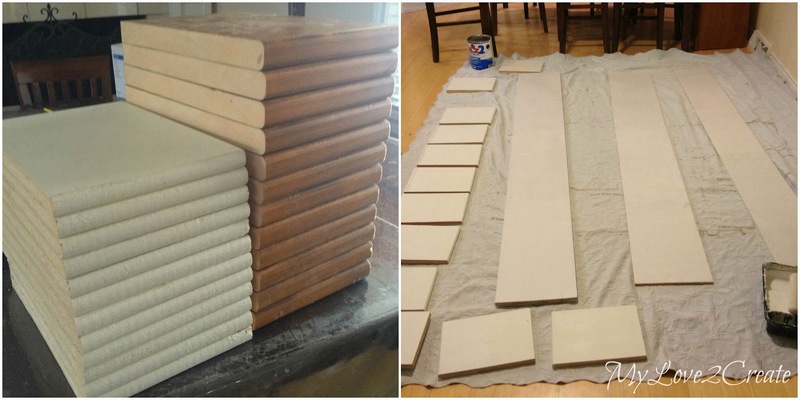 In the left photo above I have two stacks of boards. Ugh!! Yes, I cut the ones on the right first and realized they were just too thick! 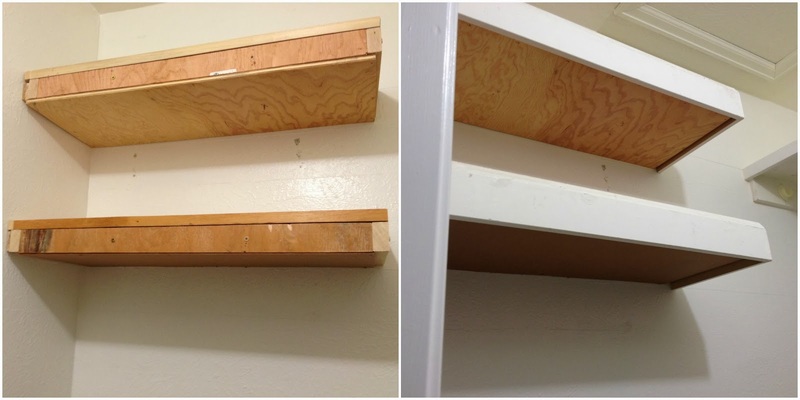 I ended up cutting the left over shelfs that I ripped out from my closet (on the left) and they were perfect, even with the rounded fronts, which would save me on trim! 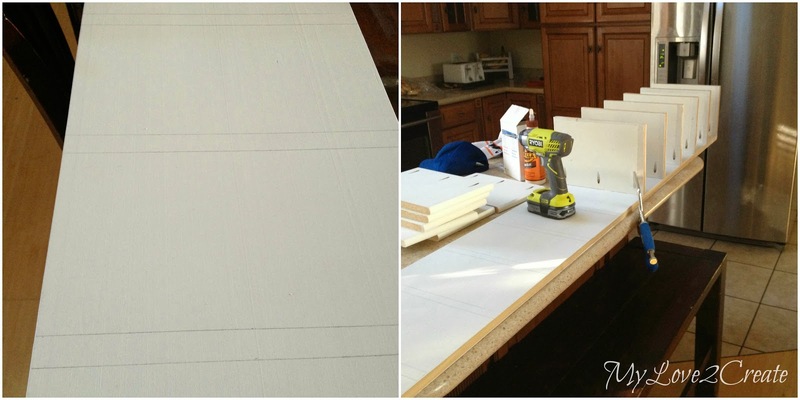 In the right photo you see all the boards for the shoe shelf primed for building. I started with my only 3/4 in thick board. I found this last year on our city's spring clean up day, who would throw out such good wood? I marked up six inches for each cubby, and where each board would go. Then I attached them with glue and pocket holes. Once they were all attached I used my pieced together side board. I had some 1/2 inch scrap plywood that I had from somewhere free, but they were not long enough so for the side and back pieces I attached two shorter boards with pocket holes to make one long board. I glued and nailed it on. Then flipped it over and glued and nailed on the back piece! I had my 10 year old help me carry it into the closet so I could attach it to the base I built. Here it is! So little! These were scrap pieces and I used the same height as my tower bases. 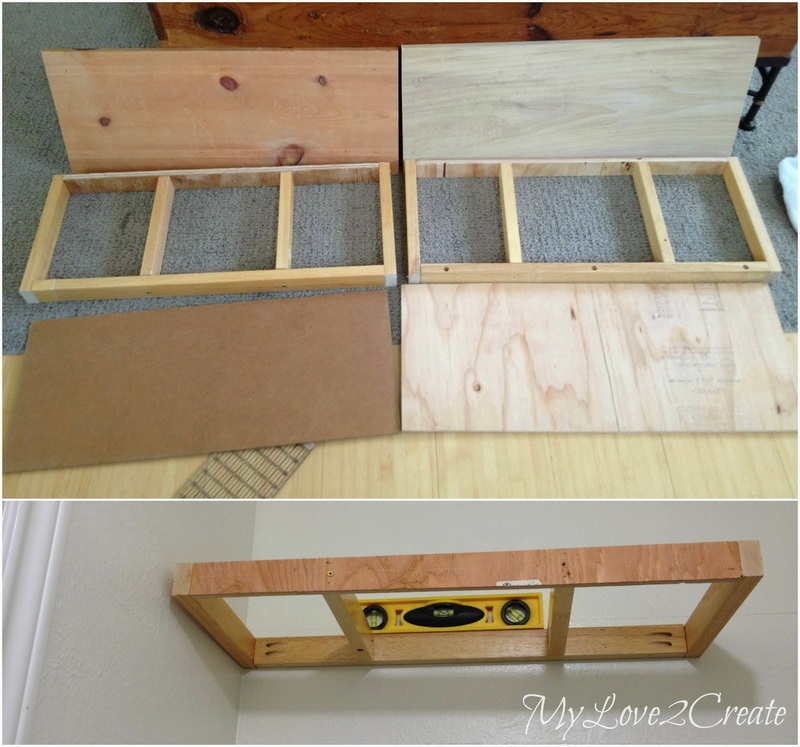 I added a top piece and nailed it into the top of the moulding in the back, right photo. You can also see where I screwed the base into the moulding in the left photo. At this point I am shooting from the hip, no plans just making it up as I go along (it always seems to take longer this way...). When I added the shoe shelf to the base I simply screwed it right into the tower, from several of the cubbies, and I secured it to the base. It is not going anywhere! 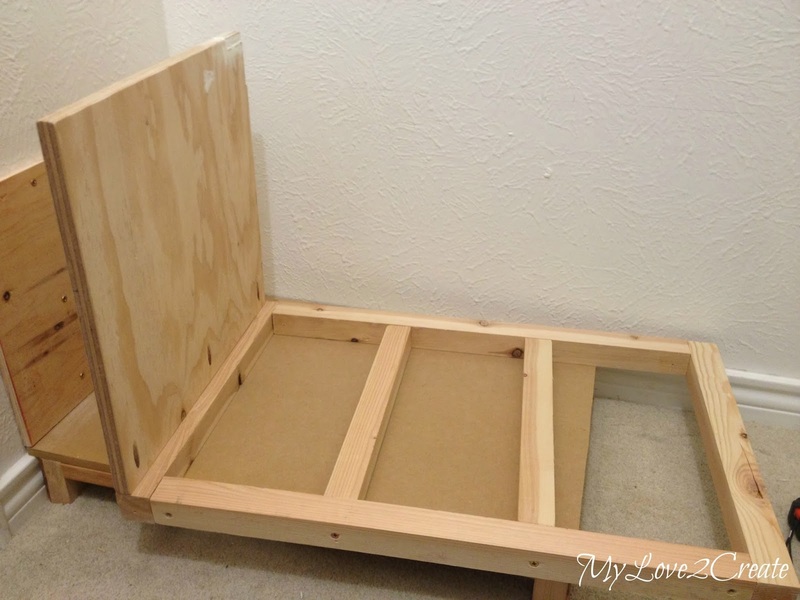 At first I was just going to build a simple bench without a base, but my husband said it would look better with a drawer instead of crates rolling out like I had planned. I decided he was right, so I built another base. These pieces of finished wood were so hard to drill into, they gave me serious fits, they were obviously from some piece of furniture that had been taken apart. They were also a little too wide so I had to cut notches with my jig saw. I had this piece of mdf, that I had picked up and it was almost the exact size, I only had to trim one side! I nailed it down to the moulding and base. I used this piece for the wall support, screwing it into the studs. You can also see where I wrote the level line on the wall for my top. Then I added my bench top support and a side piece, here it is upside down, showing my pocket holes. And here it is attached to the base, the right side goes all the way to the floor and I screwed it into the base from the sides. The top is screwed into the studs in the back and sides. If you look close you can see my side wall is VERY uneven, and I had to uses shims to fill in the gaps. So much for my straight top piece! 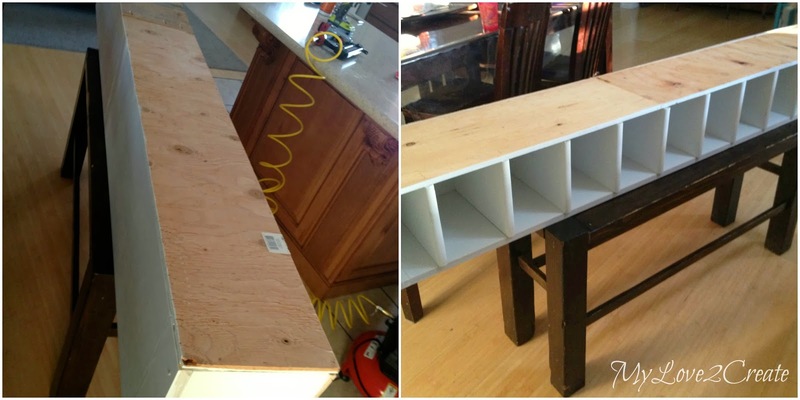 My next step was building a drawer, a very big drawer! 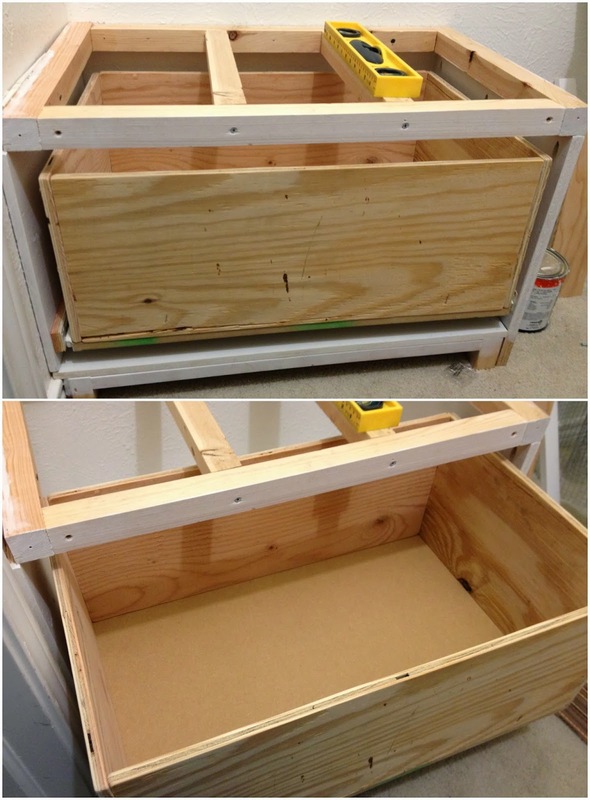 I did have to go and buy 16 inch drawer slides for this, but I used my scrap wood for the drawer box, and bottom. You would think after installing 10 drawers this one would be a cinch, right? Nope, it gave me endless headaches, and I swear I re-did it 50 times and it still isn't perfect! Oh well, it is good enough! 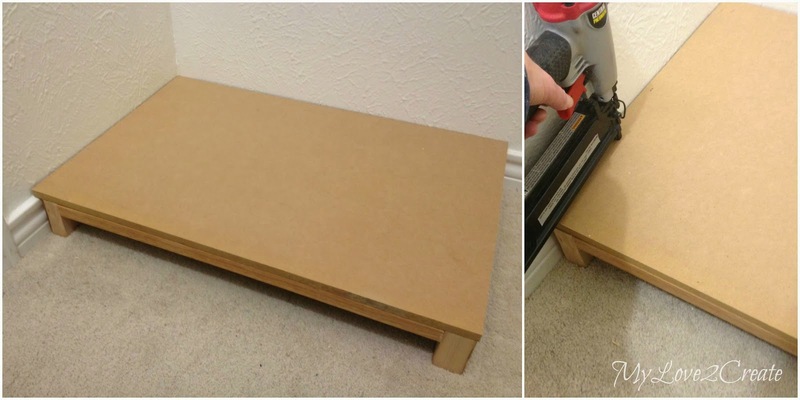 For my bench top I found some 2x's and measured, cut, and used glue and pocket holes to join them together. 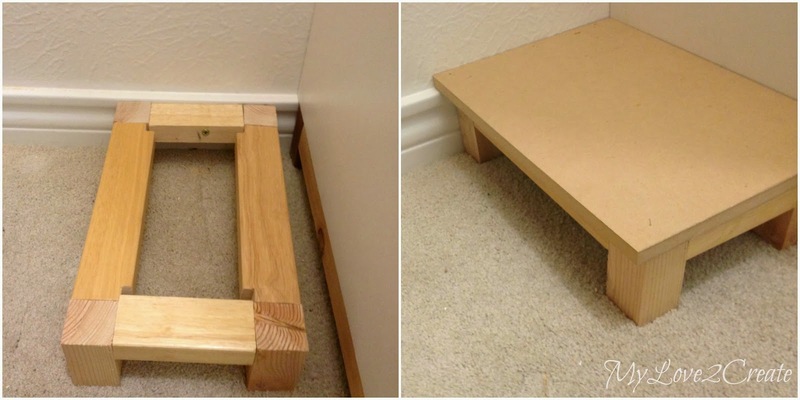 The 1x2's in the photo on the right were for the top support for the bench. 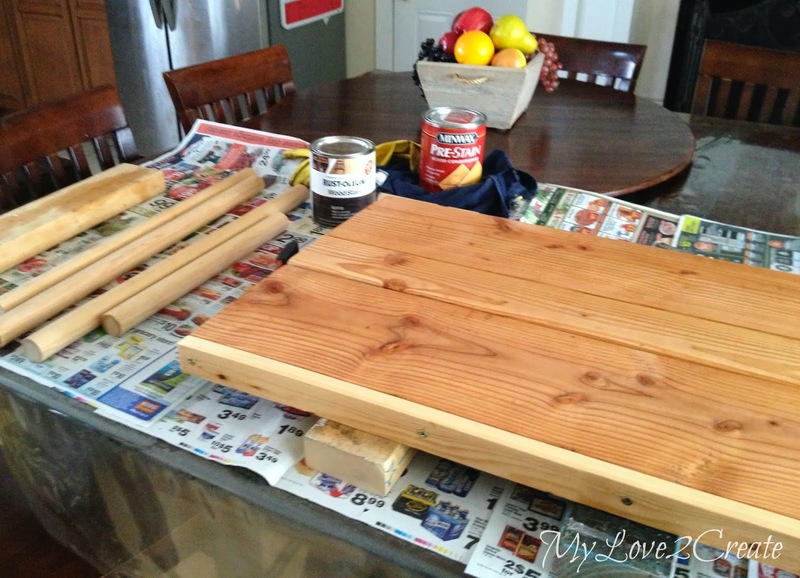 Most of the closet will be white but I wanted to stain the rods and bench top, so here they are with wood conditioner. 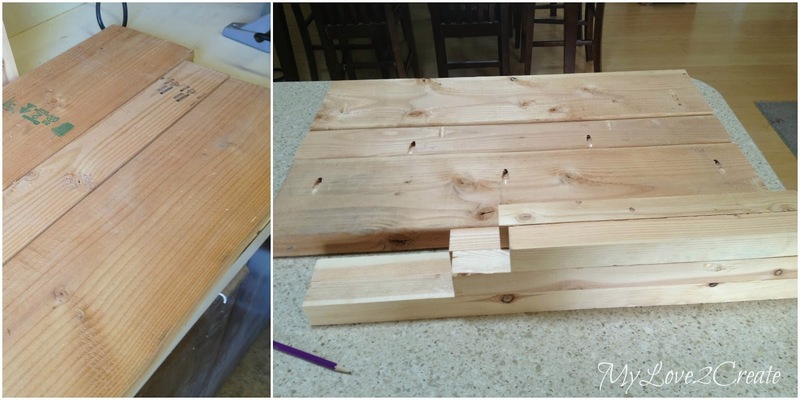 You can also see that I added a 1x2 on the bench top, I did this because I forgot to factor in the trim for the front of the bench, and I need the bench top to be a little longer so it could hang over the trim a little. I stained them with Rustoleum's Kona, and I love it! I also added three coats of poly, sanding with 400 grit sandpaper after coats one and two, it is nice and smooth! Above the bench, I decided to do floating shelves. 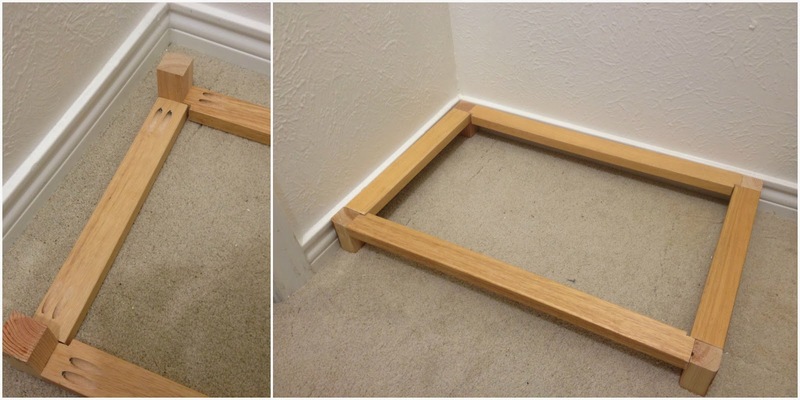 So, I built a frame and attached it to the wall, making sure it was level. I used two inch nails to secure it first and then added screws. I cut boards for the top and bottom of the frame. 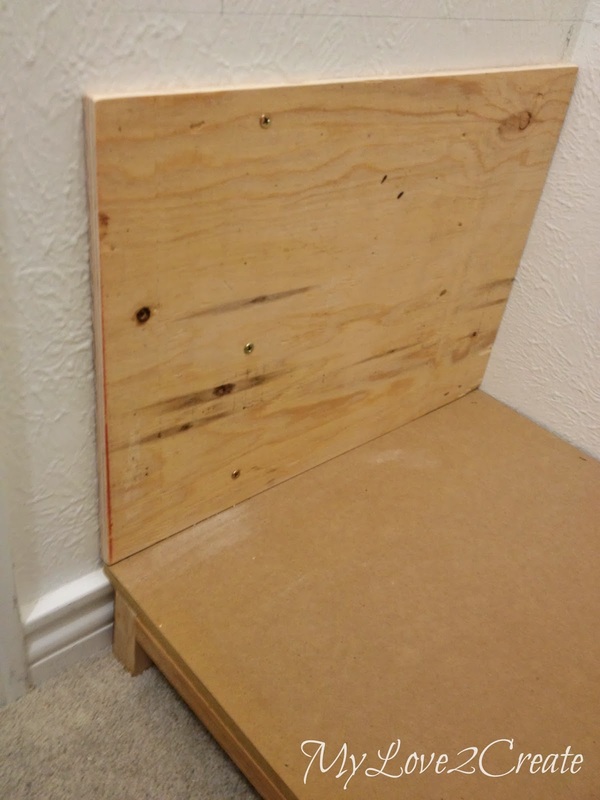 You can see how the side wall is not straight, same wall as the bench, it totally bows in, making my frame not flush with the wall. You can see all the shims I had to add to make the frame flush with the wall, and now my bottom board does not cover the length. So fun! I cut foam core, and make it crooked on one end, just like the wall, and hot glued it into place! Ta da!! Crazy, but I don't care! 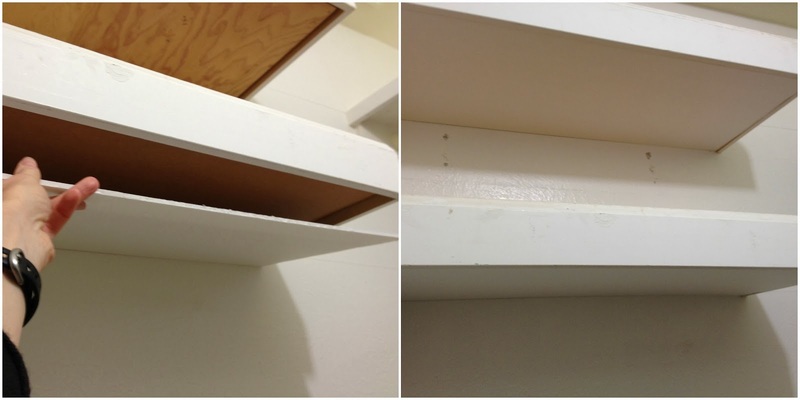 They look nice and finished and with a little caulk, you won't see the slightest gap! Insert happy dance! This concludes my post for today. As of right now I am ready to sand, prime, paint, add drawer knobs, and hooks...that is it! I hope to get it done this week, we will see, I have lots of other obligations that need my attention. But I am so so close!! I really appreciate your sweet comments! Thanks so much for following along! Seriously incredible Mindi! You are making amazing progress- what a huge job! As always I am super impressed with your building skills. You are inspiring me to pick up a few more power tools myself:) Hope you are having a great week!! Wow, Mindi, it is coming along beautifully. I am totally drooling over all the awesome storage you are going to have! I love how it's all coming together Mindi! You must be exhausted from drilling all those pocket holes! Oh man! 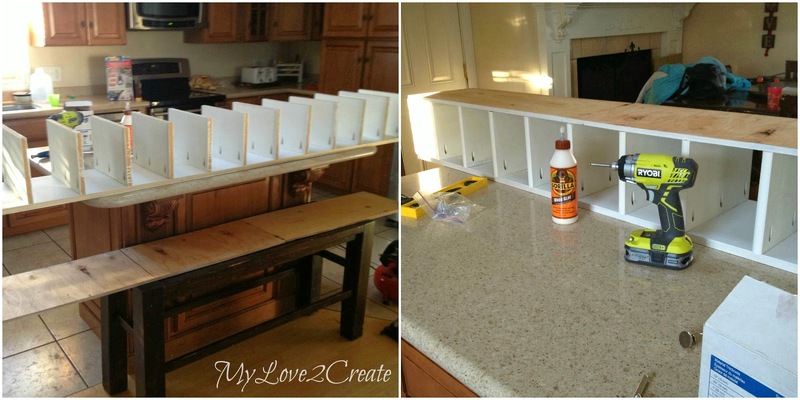 I love the idea of covering the underside of the shelves with foam core. Genius! Pinning for sure. By the way, you need to go to SNAP with me! I am so jealous! This is gorgeous! 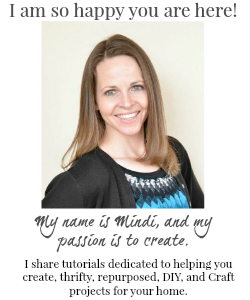 You are doing an awesome job Mindi! I don't think there is a straight wall in my house, so I would be having the same problems you are. Can't wait to see the finished closet. Thank you for sharing at What We Accomplished Wednesdays. Have a happy day! 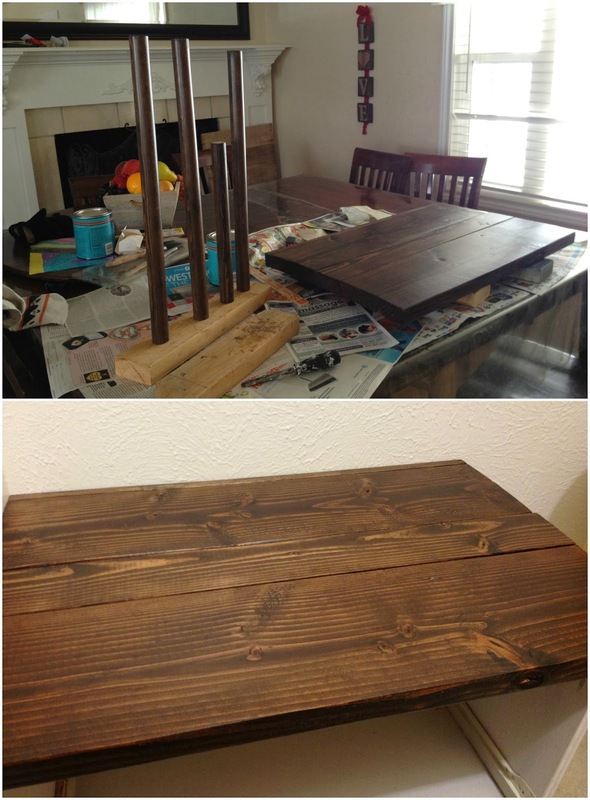 My goodness Mindi, what a project you have going on here! 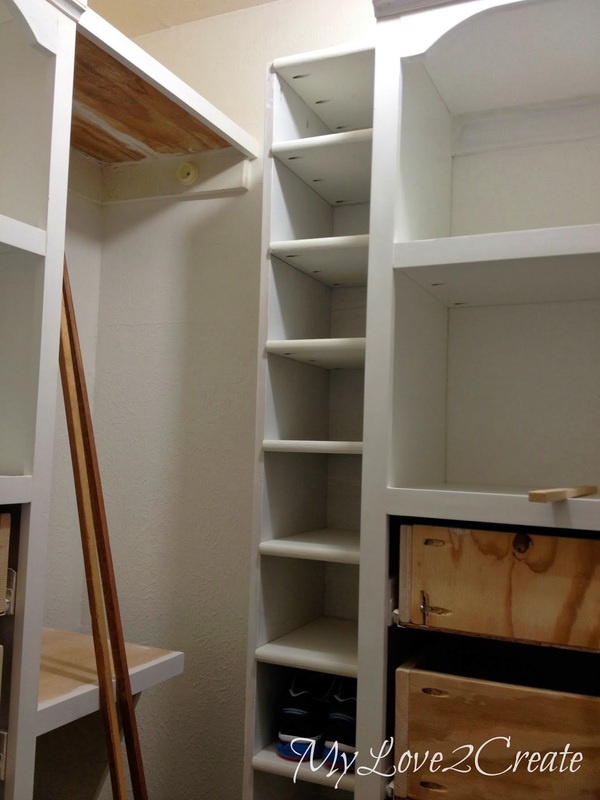 So cool that you are going to get exactly the closet you want when you are finished. It is looking amazing! I'd love for you to come link up tomorrow morning (Tuesday) at The Makers! Hope to see you there! I soooo need one of these! Oh, wow, this is a labor of love but just think how awesome it's going to be when it's finished! Can't wait to see it! WOW! That is some serious work!! Great job, I'm jealous! Girl you are crazy! That is amazing work to throw on top of the duties of a mom of 6!!! It turned out amazing though! Great work! One of the wonderful ideas I have ever seen so far. The master closet, a perfect project! I can do more with my open space as I have seen your magnificent idea! Great tutorial! I bet you saved so much money making this instead of buying it pre-made. Good for you! Thanks so much for sharing this at Frugal Crafty Home Blog Hop. I love the foam board idea!! Wow...I am impressed with your work!